DAC3 employs an advanced headroom digital filter design and a high sample-rate asynchronous USB interface with all inputs fully isolated via UltraLock3 jitter attenuation system. Benchmark DAC 3 HGC is the latest 2-channel D/A converter featuring a new ESS Technologies ES9028PRO chip delivering lower THD+N than the DAC2. Maintaining DAC2’s great build and feature set, DAC3’s dual distortion compensation systems independently remove most active 2nd/3rd harmonic distortion, lowering THD+N as well as passband ripple while improving frequency response. Faster PLL lock times and input signal switching is also enabled. DAC3 delivers outstanding musical detail and precise stereo imaging. It employs an advanced high-headroom digital filter design and a high-sample-rate asynchronous USB interface. All inputs are fully isolated via the new UltraLock3 jitter attenuation system. All digital inputs support native PCM or DSD conversion. There are no DSD to PCM conversions or vice versa to compromise music quality. DSD is transported with over DoP 1.1 bit accuracy which is supported by many media players. Benchmark DAC3 is designed to directly drive power amplifiers and speakers. XLR outputs have adjustable low-impedance passive attenuators to optimise gain staging. When these are properly matched, each component operates at peak signal level significantly improving performance. For maximum transparency and most natural audio, the DAC3 ensures no euphonic coloration is added. This is absolutely vital in studio monitoring making the converter ideal for critical reference-quality professional systems. Four balanced 32-bit DACs deliver audio to the low impedance current-voltage converters. This 4:1 summation reduces noise and distortion to ground-breaking levels. ES9028PRO D/A is an 8-channel 32-bit converter. In DAC3, four channels are added in the analogue domain to form each of the two output channels. The non-linearities in individual conversion channels are averaged across 4 summed channels and incoherent non-linearities are attenuated by 6dB. Benchmark's unique Hybrid Gain Control system combines active analogue and 32-bit digital gain control, passive low-impedance attenuators and a servo-driven volume control. The rotary volume control responds to commands from the remote. Analogue inputs are never converted to digital, and digital inputs never pass through an analogue potentiometer. Digital inputs are precisely controlled in the 32-bit DSP system which preserves precise L/R balance and stereo imaging avoiding any source of noise and distortion. UltraLock3 eliminates all audible jitter artefacts and locks with precise phase accuracy in only 6ms. DSP processing is 32-bits, headroom is 3.5dB, sample rate is 211kHz and jitter-induced distortion and noise is at least 140dB below the level of the music. Interpolation is necessary to achieve 24-bit performance but inter-sample overs cause clipping in most interpolators. This clipping produces non-harmonic distortion products often adding a harshness or false high-frequency sparkle to digital reproduction. DAC3 avoids this by maintaining at least 3.5dB of headroom in the entire conversion system. The USB system supports USB 2.0 for high-res 192kHz and DSD playback with an easy-to-install driver adding these capabilities to Windows OS. A driverless 1.1 mode supports up to 96kHz sample rates as well as quick plug-and-play connection to operating systems without installing drivers. Asynchronous in all modes, unnecessary sources of jitter are eliminated. The subsystem remains active when DAC3 is powered down preventing interruptions to playback and retaining configuration. The second coaxial input on the DAC3 can be reconfigured as a digital output. Any selected digital input including USB will then pass through to the coaxial output. The digital pass through is bit-transparent and even supports DSD (DoP 1.1). Dolby digital and DTS formats can also be passed through to a surround processor. 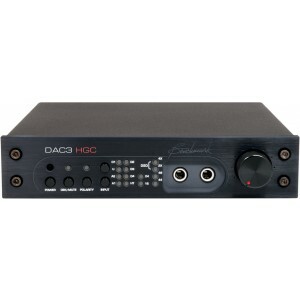 DAC3 HGC also includes a polarity switch to correct the problem of recordings with inverted polarity. A programmable Home Theatre Bypass function sets pass-through gain to unity when surround system is active so DAC3 can be integrated into a home theatre system driving L/R power amplifiers. Benchmark re-invents the 12-volt trigger. The trigger connection can be used as an input, output or both. The trigger can be used to automatically turn a power amplifier on or off. The DAC3 will also respond to a 12 volt trigger to follow the actions of another audio component. DAC3 uses high-efficiency low noise power supplies and may be operated from any standard international voltage without adjustment. To achieve the lowest possible noise, the DAC3 uses distributed power supply regulation. Each critical subsystem has at least one dedicated low-noise voltage regulator. The remote control is not included as standard but can be added at an additional cost. Please contact us to discuss.